Beneath the Rowan Tree: Do it Yourself Fabric? 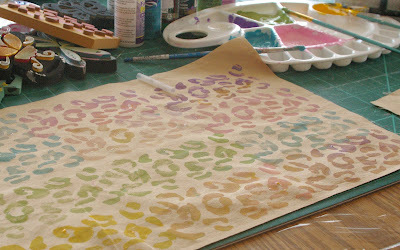 Paint Your Own Prints! We are not in a shortage situation as far as fabric goes. However, in planning a spring garland/ banner I wanted to add a dimension better suited to a four year old's interests and abilities than rotary cutting and sewing machine! So Rowan and I spent a couple happy, sunny hours choosing paint colours to match our fabric prints and creating our own personalized prints to add to our garland-to-be. 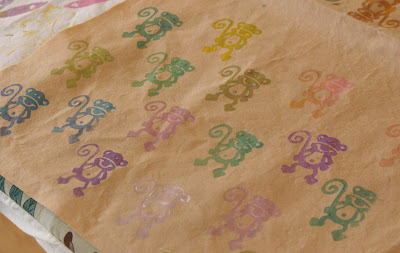 We worked as artists, robots and as fabric designers for the hippest monkeys in the jungle (I made a flashy spotted print for all those zebras who are bored with stripes) and had lots of giggles and lots of learning. We are working towards a banner along the lines of THIS ONE from the Purl Bee, but you could create your own fabric for any sort of project! Ours are intended to be sliced and diced for our garland. 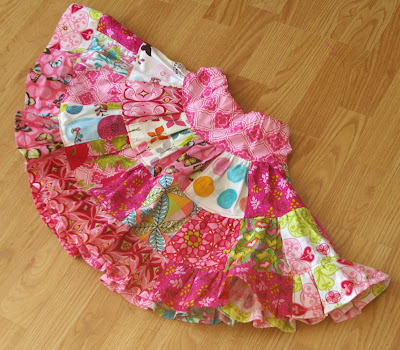 As we plan to use leftover fabrics from a skirt I made for Rowan last month: We decided to work with turquoise, ballet pink, yellow, lilac and spring green paints ~ keeping your palette to 3-5 colours will greatly increase your liklihood of liking your finished product, especially with young artists! Working with a four year old did mean a palette clean up and fresh paint at the halfway point to save us from an overwhelming number of brown prints. Work with a single layer of fabric (in case of bleeding through). Excess fabric can be rolled up, or otherwise covered to prevent accidents and unwanted splotches.Coat each stamp thinly with paint in your choice of colour(s). 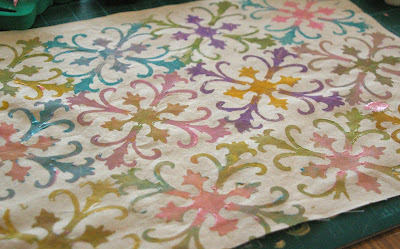 Press firmly, do not wiggle or roll the stamp.Hold fabric in place with one hand while you pull the stamp up and away with the other. 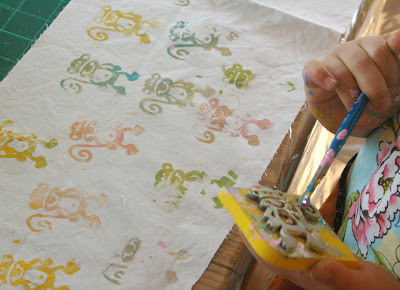 Allow to dry (if you keep your paint thin on the stamps, this won't take long). Heat set your paint if you have used a fabric medium (if you plan to use your fabric for wearables, do let it cure 24 hours before heat setting). We'll share our finished banner once we get it done! 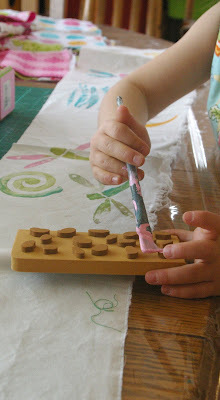 Awesome project to share with us and your 4 yr old! What a beautiful skirt! I've never had much success with printing...but it must be time for another try!